"I literally walk everywhere now." Kevin Gessay, who heads the UK operation at American culture and entertainment PR agency PMK BNC, discusses the "total lifestyle change" he has undergone since moving to London. "We come from wide open spaces in LA and everybody uses a car. It took me a little time to adjust, that I didn’t need the big space. I’ve chosen a much smaller space [to live in] so that I can walk to work. I’ve completely changed in that way – and I love it." Continuing the walking theme, Gessay and his agency are following a well-trodden path. From Edelman to Weber Shandwick, from Hill+Knowlton Strategies to Golin; major US agencies are no strangers to these shores, lured by the riches of operating in a highly lucrative PR market. The desire to open in London shows no signs of diminishing, and PRWeek caught up with the American chiefs of their UK outposts that opened more recently, or are about to debut here, to discuss their experiences. PMK BNC, the PR and entertainment marketing firm part-founded by Hollywood publicist Pat Kingsley, launched in the UK in 2012, initially headed by CEO Chris Robichaud and with a focus on building a standalone UK offer. It was important to have senior British employees from the early days. Gessay highlights Jakki Jones – "a really natural fit for us" – who runs PMK BNC’s influencer and outreach department and has held roles including bookings and talent management on programmes such as The Jonathan Ross Show and MTV Europe Awards. 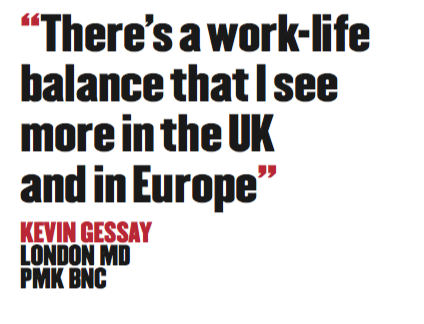 As well as the lifestyle differences, Gessay contrasts the approaches to working culture between the US and UK. "We’re from a ‘now’ culture in the States, in the sense that everything is immediate – you respond right away, there’s an urgency. [In the UK] there’s respect for time after and before work." Meanwhile, the difference in holiday culture has been a cause of some exasperation: "In July, basically the country takes their annual leave. It’s very different in the States. At first it was like, ‘hey, I need an answer on this’. I’ve grown to really appreciate and respect that balance. "It’s not that work doesn’t get done; far from it, everybody is actually quite efficient. It’s the fact that there’s this work-life balance that I see more in the UK and in Europe." For Gessay, who moved over in April 2014, the key challenges have been getting used to a different set of people and a different market. "We specialise in PR and marketing and stakeholder relations, and knowing who the players are, not coming in here like the big American company and just setting the agenda. It’s really about understanding the culture here and the people here and how business is done, and who does business, not being naive about it and really rolling up our sleeves," he says. PMK BNC is part of Interpublic Group, which offered a clear advantage in the early days, as the agency’s first UK base was at the London office of advertising stablemate McCann. It now resides with IPG marketing shop Momentum, employing 12 people from a global workforce of 300. Another US agency, Allison + Partners, made its London debut in more humble surroundings. It launched in 2011 with just one employee, Susie Hughes, who moved back to her native UK from the San Francisco office to run London operations, initially from her flat. Over time, the agency has grown to employ eight people from an office near King’s Cross. Last September another Brit, former Freuds associate director Jim Selman, became MD to spearhead the next stage of its "aggressive" UK growth, expanding the current focus on tech PR into the consumer and corporate sectors. As with PMK BNC, having the London office has certainly helped secure clients. Allison + Partners head of Europe Matthew Della Croce names global IT consultancy ThoughtWorks as one firm that views the UK presence as crucial. Overall, around half of the clients are based outside the UK, largely from the US. The workforce is split about 50/50 between British and American staff. "We’ll probably have people come here from our Asia offices to live and work," says Della Croce. "There’s no question we’ll have folk from across Europe living and working here. We believe in a diverse workforce capability." Della Croce had some experience of London before 2011, having lived and worked in the capital and been a student in the city. But he does not presume to know everything about British working culture – far from it. "I at least know what I don’t know here," he jokes. So what does he see as the main differences? "The language, while it’s called English, is very different. We can’t come in with a typical American style; it doesn’t work. And similarly, there are advantages to that American style and opportunities that arise out of the differences of style." This advantage works both ways. "If we really want anything accomplished... we will have Jim or Susie on the phone call," he points out. 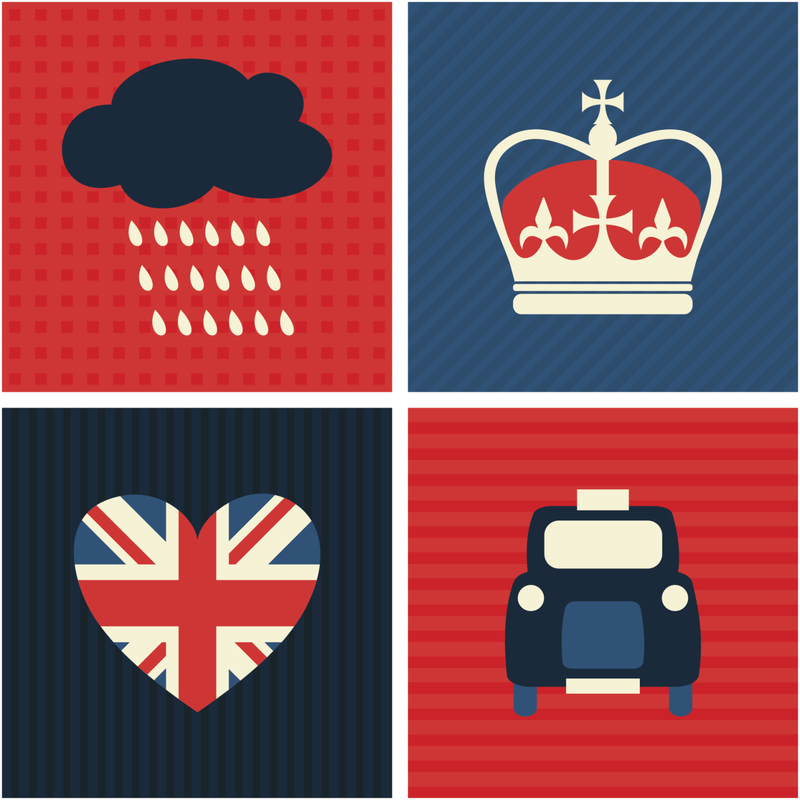 "Our clients die for an English accent – they just sound so much more intelligent than we do!" More fundamentally, he highlights how PR is perceived differently on either side of the Atlantic. "Everyone here reads at least three newspapers a day, and therefore the value of PR is absolutely, unequivocally respected and known at the highest level of the corporate world here. It is a profession that is seen as being crucial and incredibly valuable. In the States, sometimes it’s seen as less valuable – we just get brought in to sweep things under the carpet, so to speak. It’s seen as a strategic area here. There are those nuances and you learn every single day." Eric Fulwiler, vice-president of American digital and social-focused comms agency Vayner–Media, will have time to adjust to these nuances, but his first priority is getting a roof over his head. He speaks to PRWeek on the phone from what might be his new London home. Fulwiler is having a second viewing on a flat in Islington, and the signs are hopeful. "It’s a little funky, but we might be able to make it work," he says. London’s housing market is just one challenge for Fulwiler as he looks to get the UK arm of VaynerMedia off the ground under his leadership in the first half of 2016. 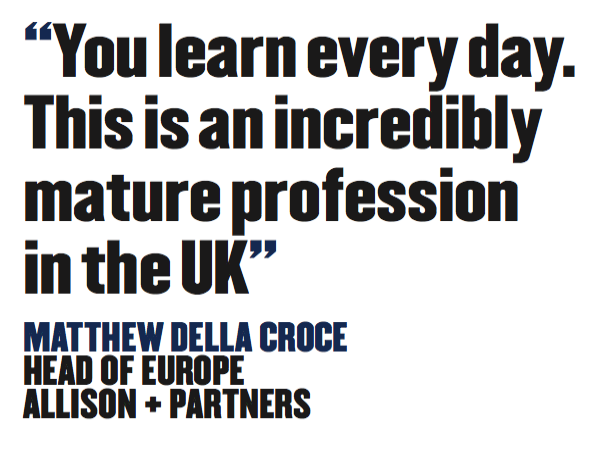 Fulwiler, like others to whom PRWeek spoke, identifies two main reasons for entering the UK: the global ambitions of the agency’s founders, and the demands of clients, who he says increasingly want support from bases in Europe and Asia. Interest from new UK-based clients has also been a spur for VaynerMedia, which currently employs around 600 people across four US offices. "We’re getting to a scale where we really think we can support global work on the ground, and be effective for our clients in other markets," Fulwiler points out. No deals for office space have been signed at the time of our conversation, but Fulwiler is targeting a co-working location, possibly using WeWork, which VaynerMedia uses elsewhere. But the London base will definitely be central: "I want to make sure we’re as appealing as possible, not only for ourclients, but for the best talent we can get." Fulwiler favours what he calls an "open enrolment" recruitment process, talking to potential hires to see if they might be a "good fit" prior to launch. The idea is to open with a combination of Brits and "veterans" from New York, depending on client demands. Either way, he stresses the need to "start small": "It will probably be something like 10 to 12 people. We want to make sure that we understand the market, not just in London, but the EU overall, and start slow and grow from there." Fulwiler is cautiously optimistic about succeeding in the crowded London PR market, pointing to the agency’s success in the similarly crowded PR hub of New York. But he stresses the need to have a quality not often associated with American businesses: humility. And getting under the skin of the local culture is seen as pivotal for long-term success this side of the Atlantic. "We really want to make sure that we understand the cultural piece, that the first few hires that we make on the ground are really strong, that we have the right clients around us to be able to showcase that we can do work in other markets, not just the US," he says. "While we will point to our success and lean on our success in the US, we really want to come in humble and make sure that we can prove ourselves over here as well."